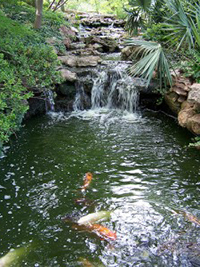 Hours: The Fort Worth Gardens is open year round starting at 8:00 am to sunset. Admission to the grounds is free, with the exception of the Conservatory and the Japanese garden which are a paid admission. Lower Rose Garden: This elegant garden was designed with inspiration from a renowned Italian villa. Built in a classic European grandeur, with numerous garden vistas over the ground, this particular garden is a favorite location for public and private garden parties and weddings. When the many thousands of roses are in full bloom, this garden offers visitors a stunning environment that soothing to the soul and exciting to the senses. Oval Rose Garden: This historic garden of roses in the Fort Worth Gardens features a unique oval shape that was designed specifically to be used in picturesque weddings and similar events. The rose garden was renovated again in 2002 and contains hundreds of varieties of roses that are the best of the best of roses that have been acclimated to the Texas climate. Visitors can find a romantic spot in the garden’s gazebo, or walk the lush planting beds and enjoy the sights and smells that surround. Fuller Garden: Elegance and relaxation are the primary theme of the Fuller Garden at the Fort Worth Botanic Gardens. The thoughtful color schemes make the garden an ideal location for parties and events, and even a soothing stroll down the many curving paths. The dramatic botanical displays of this garden blend beautifully with the architectural elements, creating a powerful garden design that invites the visitor to explore further. The spirit of the garden represents the constantly changing cycles of life. Japanese Garden: Enchantment and mystery await visitors around every turn in the Japanese Garden at the Fort Worth Botanic Gardens. Follow the winding pathways across seven acres of wonder while the peaceful and relaxing setting invite all who view them to surrender their senses. Thousands of Imperial Koi fish await their feeding in the large central pond, many of which will readily allow you to caress them for a few pieces of food. This garden will offer joy and delight to anyone with its meticulously landscaped grounds, bringing earth, stone, and water together. Perennial Garden: Visitors of all ages will find enjoyment and wonder in the perennial garden. At the heart of the garden guests will find a foaming waterfall that is surrounded by brilliantly colored floral arrangements, leading up to a calm and soothing brook that is covered with lush green ferns. Cooks and chefs will enjoy coming to the garden to view the vast assortment of culinary herbs. Photographers and hobbyists alike flock to this garden every year for the amazing vistas, and children come with their families to explore the various ponds and enjoy the peace and serenity that this shady retreat has to offer. Fragrance Garden: A garden to delight the senses and renew your wonder and amazement of nature. Don’t let this small pocket garden fool you, big things come in small packages. 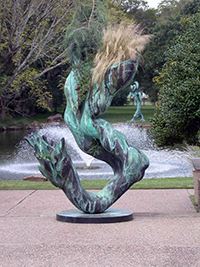 The Forth Worth Botanic Garden encourages visitors and guests to rub the leaves of the many fragrant plants, to release their amazing and pleasing aromas. You are sure to fall in love with the soothing central fountain, and the delightful ivy that covers the fences. This intimate little garden is the perfect getaway from the hustle and bustle of city life. Bring your family or your significant other and escape for the day or even just an afternoon. Trial Garden: The trial garden is the place to go if what you are looking for is the best of specialty and new plant varieties. This section of the botanic garden is set aside strictly for growing and evaluating hundreds of plant species. Those that have the “right stuff” just might earn themselves a permanent place elsewhere in the garden. Come to the trial garden and learn what new plants are growing, and just maybe you’ll find some new gem that you can incorporate into your own garden design at home. Four Seasons Garden: The Four Seasons garden at the Fort Worth Botanic Gardens offers visitors a place of quiet contemplation and relaxed reflection. Take a stroll along a secluded path lined with large living oaks that tower over planting beds that are packed with hundreds of daylilies, irises, and chrysanthemum. This garden has been a guest favorite for years because of the tranquil setting that provides exciting color and texture throughout the entire years. Texas Native Forest Boardwalk: This elevated boardwalk is actually an outdoor living classroom that features viewing platforms that overlook the surrounding grounds, and it also provides access to the rest of the major areas of the Garden. Designed to foster interest in the region’s native forests, visitor can take the lessons they learn here on conservation and stewardship back home and apply those principles in their own gardens. Conservatory: The ten thousand square foot conservatory at the Fort Worth Botanic Gardens showcases a kaleidoscope of exotic trees, bromeliads, and orchids that originate from all over the world. Come explore the wonders of a tropical environment through the winding paths of this stimulating garden. Water Conservation Garden: This garden is a demonstration of how beautiful garden designs do not always have to mean high water consumption, and bills! This garden is full of water friendly plants, both native to the region and others that have adapted. Visitors will find endless ideas to take home and use in this habitat that is wildlife friendly. Water Wise Entrance: The northern entrance to the Fort Worth Botanic Gardens is otherwise known as the Water Wise Garden. Brilliantly colored, water friendly native plants live and grow here from spring until fall. Among the collection visitors will find esparanza, yucca, Mexican bush sage, salvia, and Texas sage.